Whatever the size of your home, energy is being consumed every day, around the year. And while the utility bills might show you a monthly total, there are important questions about how energy is actually being used. Getting answers to these questions will help to conserve energy and save on seasonal energy costs. This is where an EnerGuide Rating can be valuable – it’s the first step in getting answers to home energy consumption patterns. The rating will tell a homeowner exactly how energy efficient the home is. Better still, the EnerGuide Rating will clearly identify the areas of the home where a renovation, upgrade, or retrofit will increase efficiency and use less energy. 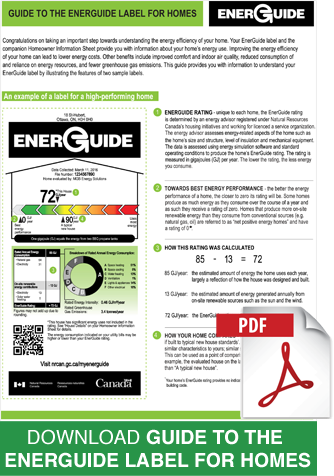 Homeowners should be aware that EnerGuide Ratings are issued by Certified Energy Auditors, under the umbrella of Natural Resources Canada. It’s a mistake to contract a “door-to-door” seller who may claim EnerGuide or Energy Star authorization. Professionally expedited, an EnerGuide Rating ranges from 0 through 100, with a high rating indicating more optimum energy efficiency. Typically, a new home that’s built to the established building codes will have a rating of 65+. The home that has had energy efficiency upgrades could reach 73, or even higher. Understandably, an old home will rate below 65 – clearly in need of retrofits to boost efficiencies (and the rating). With a new vision for energy conservation, and new emphasis on home energy efficiency, there’s an improved EnerGuide Rating System (Version 15) offering more opportunities and options for homeowner improvements. In fact, it’s now possible to compare one home with another, and therefore assess comparative energy patterns. Probably the most important new feature is a new rating system. Replacing the 0-100 measurement, the new rating estimates how much energy is consumed in a year. The lower the rating, the more energy efficient the home is. The new system will allow a homeowner to calculate exactly how much is being spent on energy bills annually. The main aim of the EnerGuide Rating System is to give homeowners a “game plan” for achieving energy efficiency in the home, using less energy, and saving dollars. Homeowners can therefore identify where energy is being used, and where energy is being wasted. This will set the stage for energy upgrades that will solve problem areas, and deliver savings. Today, an EnerGuide Rating belongs to the homeowner – but in 2019, every home will require an EnerGuide Rating before it is listed for sale. Needless to say, a better rating will add value to a home. Moreover, this shift to transparent ratings will create higher standards for both real estate people and homebuilders. From air leakage, to poorly performing HVAC equipment, to badly installed insulation, there are a number of upgrades and retrofits that a homeowner can undertake – all of which will improve energy efficiency. At Barrier Sciences Group, home energy experts take the process from start to finish. The BSG team begins with an initial Home Energy Audit, identifies deficiencies throughout the home, and provides the necessary remediation – from renovation to retrofitting.